Walmart’s Leeds-based subsidiary Asda and Sainsbury’s on Tuesday committed to deliver £1 billion of annual price cuts as they attempt to salvage their proposed merger. Last month, the UK’s competition regulator the Competition and Markets Authority (CMA) delivered a potentially fatal blow to Sainsbury’s proposed £7.3 billion takeover of Asda, saying it was unlikely the companies would be able to address its “extensive” concerns about the deal. Asda and Sainsbury’s also said on Tuesday they were prepared to divest some supermarkets and petrol forecourts across both brands. The CMA’s final report will be issued by April 30, 2019. Sainsbury’s CEO Mike Coupe and Asda CEO Roger Burnley said: “We are trying to bring our businesses together so that we can help millions of customers make significant savings on their shopping and their fuel costs, two of their biggest regular outgoings. “We are committing to reducing prices by £1 billion per year by the third year which would reduce prices by around 10% on everyday items. “We hope that the CMA will properly take account of the evidence we have presented and correct its errors. In a long stock exchange statement on Tuesday, Sainsbury’s said: “J Sainsbury plc and Asda Group Limited have recently submitted to the Competition and Markets Authority (CMA) their responses to the CMA’s Provisional Findings and Notice of Proposed Remedies. 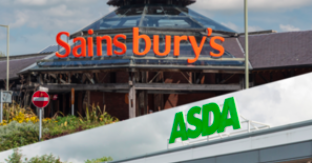 “Sainsbury’s and Asda strongly disagree with the CMA’s Provisional Findings and have found the CMA’s analysis of their proposed merger to contain significant errors. “This is compounded by the CMA’s choice of a threshold for identifying competition problems that does not fit the facts and evidence in the case and that is set at an unprecedentedly low level, therefore generating an unreasonably high number of areas of concern. “In their detailed response to the Provisional Findings, Sainsbury’s and Asda have sought to address these economic and legal errors. “Sainsbury’s and Asda have also responded to the Notice of Proposed Remedies by outlining supermarket and petrol forecourt divestments across both brands that would satisfy reasonable concerns regarding any substantial lessening of competition as a result of the merger by applying a conservative yet reasonable threshold. “Sainsbury’s and Asda have given the detail of their estimated £1.6 billion cost savings to the CMA. “This allows them to fund the £1 billion customer price commitment while also delivering on the commitments to shareholders of £500m of net synergies, low double digit ROIC (return on invested capital) and double digit EPS accretion by the end of the second full financial year.